Location: Spectrum Center: Charlotte, N.C.
After Thursday night, Louisville will have faced a North Carolina team that appeared to be in three very different states for each of its meetings with the Cardinals. On Jan. 12, U of L went to Chapel Hill and walloped a UNC team still looking to find its footing. On Feb. 2, a Tar Heel team that was in the process of realizing its full potential came into the KFC Yum Center and returned the favor. On Thursday, the Cards will go up against a North Carolina team that is still in the hunt for a No. 1 seed in the NCAA tournament, and looks to be one of the five or six teams in the country most capable of winning the national title. As Chris Mack said Wednesday night, North Carolina isn’t going to change what it does for anyone. Scouting the Tar Heels is the easy part. 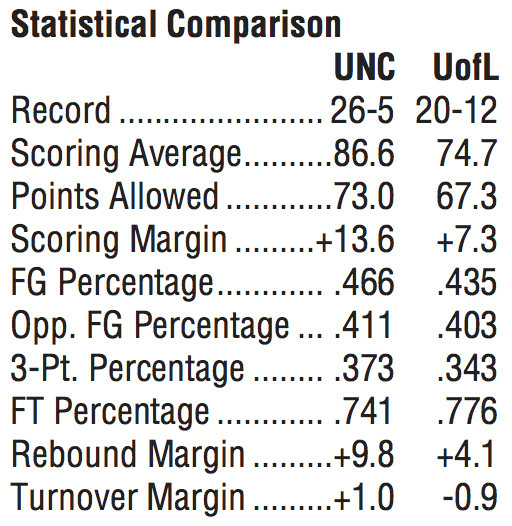 The tough part is trying to find a way to stop (or at least slow down) all the things that UNC does so well. You know the nuts and bolts here: North Carolina plays at the 4th-fastest pace in the country, they roll teams with their combination of freak athletes and elite scorers, and they thrive on second chance opportunities (No. 18 in offensive rebound percentage). UNC is second in the nation in rebounding margin (+9.8), second in assists per game (19.3) and third in scoring offense (86.6 ppg). Six Tar Heel players are averaging over eight points a game, led by First Team All-ACC performer Cameron Johnson (16.8 ppg). While Johnson is the team’s leading scorer, and Luke Maye is probably the team’s most well-known player, it’s been freshman point guard Coby White who has made Carolina go this season. White, who was a Second Team All-ACC selection, averaged a team-high 18.1 ppg in conference play, is Carolina’s all-time leader in three-point field goals by a freshman (75), and is climbing the list for most points by a Tar Heel freshman (currently ninth with 490). As good as he’s been all season, White has struggled against Louisville. His two lowest-scoring games in conference play have both come against the Cardinals: four points in the first meeting and eight in the second. He shot a combined 3-for-18 from the field in those games, and had as many turnovers (6) as assists (uh, also 6). Thankfully for North Carolina, White was the only starter who didn’t score in double figures in the second game against Louisville. The Cardinals struggled mightily with the senior forward duo of Maye and Johnson, who both posted double-doubles. Overall, North Carolina has been spectacular since being embarrassed at home by Louisville. They’ve been defeated just once — a 69-61 setback at the hands of their ACC co-champion, Virginia. Since that UVA loss, the Heels have won seven straight, including three wins by a combined 43 points over ranked opponents (Florida State and Duke twice). To sum up: These guys are really good and they’re playing at their highest level right now. STRENGTHS: Transition offense, three-point shooting, home court advantage, free-throw shooting, offensive rebounding, defensive rebounding, athleticism, depth. WEAKNESSES: Getting to the free-throw line, turnovers, transition defense, interior defense, interior scoring. —Louisville is now 2-3 all-time in the ACC tournament, but is 0-3 in quarterfinal games. —Louisville and North Carolina met in the quarterfinals of the 2015 ACC tournament, with the fifth-seeded Tar Heels pulling a 70-60 upset of the fourth-seeded Cardinals. —North Carolina has a 100-46 all-time record in the ACC tournament, including a 21-7 mark in Charlotte. —This is the ninth time in 16 seasons that Roy Williams has led UNC to at least a share of the ACC regular-season championship. Under Williams, the Tar Heels have won the regular-season crown in 2005, 2008, 2009, 2011, 2012, 2016 and 2017 and shared the title in 2007 and 2019. —UNC’s 32 ACC regular season titles are 13 more than any other program. —Louisville has made it to at least the quarterfinals in each of the last eight conference tournaments it has participated in. —This is Louisville’s first time being a No. 7 seed in a conference tournament since 2012, when the Cardinals won four games in four days to claim the Big East tournament title. —This is the fourth time North Carolina has won an ACC regular season title and then faced a team it had previously lost to in its first conference tournament game. The Tar Heels were victorious in all three of the instances where this had happened previously. —Louisville will be wearing its standard road black uniforms on Thursday, the same ones it wore in the 21-point win over North Carolina in Chapel Hill. —North Carolina has won 18 Atlantic Coast Conference Tournament championships and played in the championship game a record 35 times. —UNC’s 45 wins in the quarterfinal round are more than any other team (Duke is second with 42). —North Carolina is 174-19 all-time in games played in Charlotte. 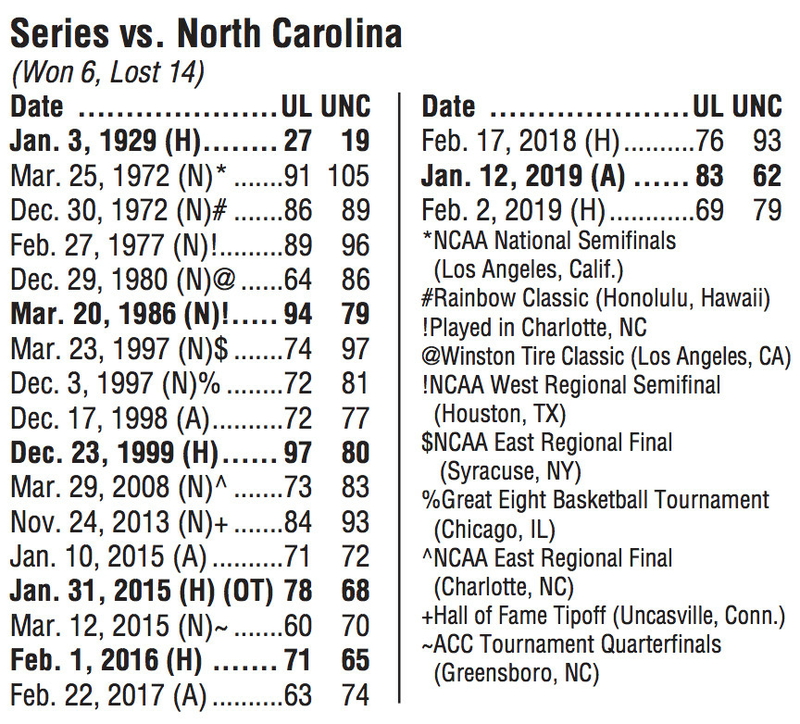 —Louisville is 8-8 all-time in games played in Charlotte. The Cardinals lost to North Carolina in Charlotte in the 2008 Elite Eight. —Jordan Nwora is the second-most improved scorer in the nation with his 17.5 scoring average (fifth in the ACC) up 11.8 ppg from his 5.7 average last year. He has scored 20 or more points on 13 occasions this season and has eight double-doubles. He was named the ACC’s Most Improved Player earlier this week. —North Carolina is 13-1 in the Spectrum Center. That includes three ACC Tournament wins and a title in 2008. —North Carolina had three of the 10 players on the ACC’s first and second teams. Cam Johnson was a First Team performer, while Coby White and Luke Maye made the Second Team. —Chris Mack is 11-8 all-time in conference tournaments. He’s reached the championship game twice, but has never won a conference tournament title. —UNC is 24-8 all-time in the ACC tournament as a No. 2 seed and have won the ACC Tournament five times from that spot (1975, 1981, 1991, 1994 and 1998). —Louisville has made it to at least the semifinals in six of their last 10 conference tournaments, but never in the ACC. —Louisville has won 12 of its last 15 conference tournament games and has won four of the last nine conference tournaments it has competed in. —Louisville is one of just four schools which have won 20 or more games on the court in each of the last 17 seasons (also Kansas, Duke and Gonzaga). Record-breaking number of West Nile cases reported in Mass.